I designed some shirts with a similar feel for Bang-On T-Shirts. There are a bunch on eBay but with 'hope' or 'progress' instead of 'obama'. Check it out. have you checked cafepress.com? they may not have that exact poster, but i've seen similar ones that look just as cool. 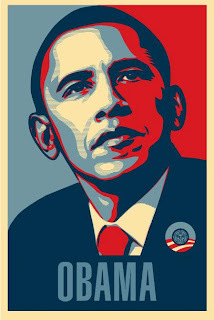 We managed to snag one of the second series of Shephard Fairey prints off the barackobama.com site when they released them. It took like 5 weeks to get to us, but we finally got it. It is huge and beautiful. I wish I had thought to buy a second, I would totally give it to you. But you'll pry it from my cold dead living room wall (where it resides proudly near our print of "The Rescue"). Just finished listening to Dreams of My Father. Great. Finally we can look forward.